Before I go any further: many thanks to Dame Evelyn for indulging me. Artists and celebrities grant interviews to promote themselves, and they get paid for endorsing products and activities… but there was nothing to be gained for her through this meeting. It was entirely for my own benefit, furthering the credibility of my project and encouraging me to carry on. It confirmed my commitment: quitting now in favour of doing something easier and perhaps more exciting and glamorous is not an option any more – I’d be losing face. I contacted her business management team in advance of her solo recital at the CIT School of Music in Cork a few weeks ago. Assuming that there would be a press conference, I inquired about accreditation. The schedule was hectic, though, and there was no press conference and no time for an interview. I got more than I bargained for, though: she would meet me backstage after her concert with the National Symphony Orchestra in Dublin on December 9th. Arrival at Heuston Station… find a cab and drop my bag at the B&B… grab a quick bite to eat… then a quick shower, careful not to get my hair wet… ready!!! It is only a short walk from my B&B to the National Concert Hall. I arrive at about 6:00 in the evening – plenty of time to find my bearings and to relax over a mug of coffee. I am supposed to make myself known to the staff at the NCH. Somebody tells me that I need to go to the RTE desk. There won’t be anybody there until 7:00 – ah, well, that’s o.k. There is a public conversation between her and Richard O’Donnell, the orchestra’s Percussion Section Leader – it will be over at 7:30, leaving me with plenty of time for the technicalities before the concert starts. The talk is upstairs – no problem, my walker folds up nicely, and I can carry it in one hand while holding on to the bannister… but there is no need for any of that. A very helpful NCH staff member introduces himself to me as Ralph and takes me through the kitchen to a “secret” elevator. I find a seat in the Carolan Room. Ralph goes away and returns a few moments later with Erica, a member of the RTE team. She is going to make all the necessary arrangements. I won’t need to check in with the RTE desk downstairs at all now – very convenient, because I have the best seat in the house: front row, middle, upstairs. The half hour conversation is over after what feels like 10 minutes to me. What an articulate, very lively and expressive speaker! The concert starts with excerpts from Wagner’s Götterdämmerung, the last installment of the Ring Cycle, played nicely by our National Symphony Orchestra, covering the whole dynamic rage from barely a whisper to a roaring thunder. 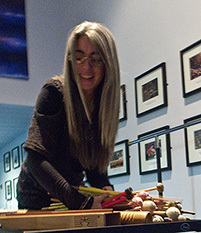 The piece is sometimes billed as a Percussion Concerto, but Evelyn Glennie and Christopher Rouse prefer to call it a “Fantasy for Orchestra and Percussion”. I reckon it sits somewhere between a Concerto and a Symphonic Poem – less strictly formal than the one and less programmatic than the other. It comes across as three movements: fast-slow-fast, with a very quiet intro and reprise. True to the spirit of Wagner, Dame Evelyn’s performance was theatrical as well as musical. She started crouched on the ground, leaning over two Güiros, scraping them gently. Then she rose to the sound of the orchestra rising, and worked her way across the stage from one set of instruments to the next, from the left to the right as seen from the audience, and back again, lowering herself to the ground, gently scraping the Güiros again. What happened in between was pure musical fireworks: always changing, never dwelling on any mood for any length of time… a case of “no rest for the wicked”, perhaps? If I was asked for an interpretation, I would say that I saw Alberich rising from his grave, moving among humans once again, doing what he does best – creating havoc and chaos – before returning to where he came from. The highlight, for me, was Dame Evelyn getting behind a drum kit. I suggest “The Art Of Violence” as a subtitle for the performance. And then: The Interval. I have an appointment I must keep, backstage… it’s all a blur of anticipation and excitement… and then I am there, backstage, in a lofty corridor. There is a lot of activity. I sit down on a sofa and keep my mouth shut. Dame Evelyn is exchanging greetings with some people, autographing something… and then I am the only one left, apart from her own crew. What, all on my own? What was I going to say… all right, my note book, my reading glasses… let me find my reading glasses… where on Earth are my READING GLASSES??? I gave her one of my personalized Cork City Gamelan Souvenir CDs – not without cautioning her that I am just an enthusiast and by no means a professional music composer. I also snapped a few pictures. I have a Leica with a really fast lens, so I generally don’t need to use a flash – unfortunately, the light turned out to be too dim. Here is the one just barely presentable shot I got… after reducing it to not much larger than a postage stamp to hide the blur and grain. Please, check back occasionally to find out what we spoke about during this meeting. You can subscribe to the RSS feed, or you can follow the Cork City Gamelan on Facebook. This entry was posted in Music Making for People With Disabilities, My Sticky Opinions. Bookmark the permalink.